I split the output into two columns, module name and procedure name. I started off creating a large array for the output, rather than re-diming for every new line.
' Declare variables to access the Excel workbook.
' Declare variables to access the macros in the workbook.
' Declare other miscellaneous variables.
' Get the project details in the workbook. If Err.Number <> 0 Then sFileName = "file not saved"
' Iterate through each component in the project.
' Find the code module for the project.
' Scan through the code module, looking for procedures.
' This line has no procedure, so go to the next line. 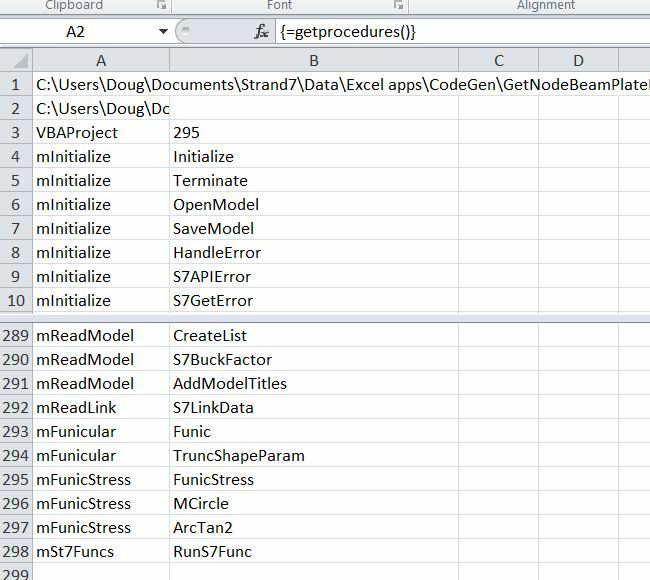 sOutput(3, 1) = "Project protected"
sOutput(3, 1) = "No code in project"
This entry was posted in Arrays, Excel, UDFs, VBA and tagged Excel, GetProcedures, list all VBA procedures, UDF, VBA. Bookmark the permalink. (It needs a reference to Microsoft VBA Extensibility 5 enabled, that may have been the problem).